Protein dynamics is the key to understand biological function. We are interested in the development of coarse-grained simulation techniques based on Elastic Network Models that allow to deal with large molecular systems and extended time scales. 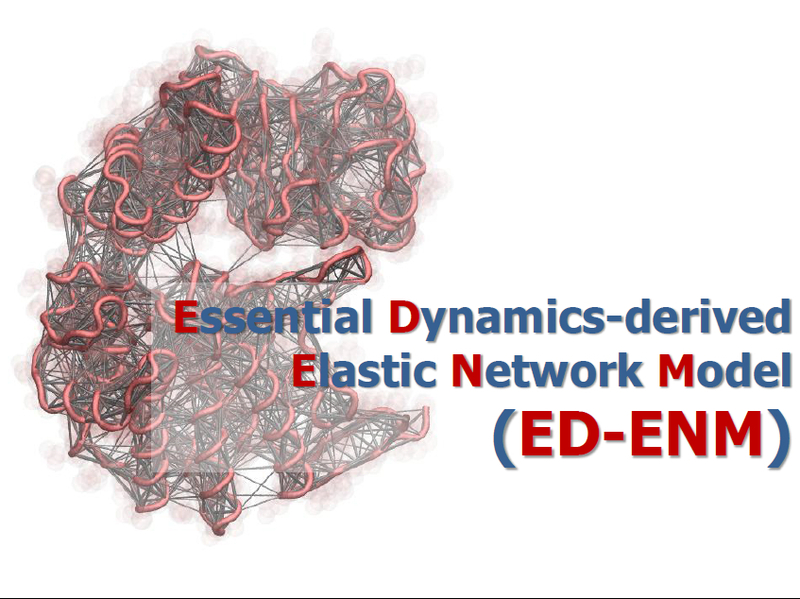 An Elastic Network Model (ENM) is a minimal model of a protein, as a chain of beads (the aminoacids) connected by springs (that play the role of chemical bonds). Diagonalization of the topology matrix of this network yields the normal modes of vibration of the system, which describe the natural directions of motion. Even simple, these models allow to predict large scale conformational changes with striking accuracy: for example, just two normal modes can trace almost perfectly the transition between the open and the close states of a protein which is needed for its biological function. We have developed novel ENM yielding results close to Molecular Dynamics Simulations, ED-ENM (Orellana at al, 2010). We are also developing network-perturbation techniques to predict the impact of mutations in protein dynamics.